A Franciscan priest, the Rev. Dhiya Azziz, was kidnapped from Syria over the weekend. This morning, two Catholic priests from Homs told me of the abduction of the Rev. Dhiya Azziz. He is a member of the Custody of the Holy Land, an apostolate of the Franciscans charged with the care of Catholics in the Holy Land since the visit of St. Francis to the region in the Middle Ages. The kidnapping took place on Saturday 4 July, while he was in his parish of Yacubiyeh, a village in Syria’s Idlib province, more than 56 miles northeast of Latakia. The whole area is under the control of different Islamic armed brigades, including Jabhat al-Nusra — which is affiliated with al Qaeda and is considered the most powerful and predominant force. They also mentioned that another Franciscan priest, the Rev. Francois Murad, was abducted and killed in the same region in June 2013. Father Dhiya’s kidnapping is the latest in a series of attacks on Christian religious since the start of the Syrian civil war in 2011. In 2013, militants kidnapped the Rev. Paolo Dall’Oglio, S.J., in Raqqa, a group of Greek Orthodox nuns in Qalamoun to the west of Homs, and the Greek and Syriac Orthodox bishops of Aleppo. The nuns were eventually returned to their convent unharmed, but Father Paolo and the bishops remain missing. In 2014, a Dutch priest the Rev. Frans van der Lugt, S.J., was murdered in Homs. The priest served in Syria for more than four decades. He was involved in interreligious dialogue and had built a spirituality center that housed children with mental disabilities. The same year, another Franciscan priest, the Rev. Hanna Jallouf, was kidnapped together with as many as 20 people from his parish in Qunaya, a neighboring village of Yacubiyeh — the two are less than a mile apart. In February, the Islamic State kidnapped at least 90 Christians from villages in northeast Syria. And in May, the Rev. Jacques Mourad was kidnapped at gunpoint from a monastery southeast of Homs. Iraqi refugees came to Lebanon because they had no other choice. They were uprooted from what was normal and familiar — from schools, homes and lands. More importantly, they have all witnessed the horror of war. They fled in large numbers from the bombing and destruction that ravaged their homeland, seeking refuge in Lebanon and neighboring countries. So far, an estimated 1.8 million Iraqis, fleeing ISIS, have been forced to leave their homes in fear for their lives. As a result, a new wave of around 1,500 Iraqi Christian refugee families — including about 500 children who were pulled up from their schools and were at risk of being a lost generation — entered Lebanon in 2014, settling in densely populated areas of Beirut and Mount Lebanon. From their first day in Lebanon, the Syriac Catholic Church has mobilized resources and staff to offer emergency assistance to these refugee families. So far, 1,080 Christian Iraqi refugee families have been screened, identified and supported through different local and international donors. They are provided with food and non food items, shelter, and other basic needs. To rescue the lost generation who already have lost one year of their school life, the Rev. Firas Dardar, from the Syriac Catholic Church, opened a school to educate the Iraqi children. He hired two floors in an old private five-story building school which provides education to Lebanese students in Nabaa, a densely populated Beirut suburb. Monday through Thursday, they are taught the Iraqi curriculum which Father Dardar brought from Iraq. It includes classes in English, Arabic, science, mathematics, civic education, sports and drawing activities. Fridays are specialized for catechetical studies. CNEWA’s Beirut office, thanks to its donors, is supporting the local church with emergency aid: mattresses, blankets, food and non-food packages to these Iraqi families. In an attempt to save the future of these children and preserve their Christian faith and hope, CNEWA will support their catechetical studies and education. Despite the huge efforts exerted by the Syriac Catholic church to support these needy families, much is still needed. Many times, they still fall short of funds. To support CNEWA’s important work in Lebanon, and to aid these families, visit this giving page. And please keep all our brothers and sisters in the Middle East in your prayers. In this image from 2011, Father Roman Prokopets hears confessions at the Druzhba Camp for orphaned children and youth in the village of Svirzh, Ukraine. 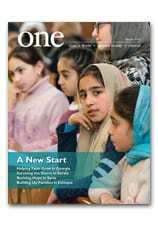 To learn more about the life of a priest in Ukraine, read about men “Answering the Call” in the November 2011 issue of ONE. This image from 2002 shows Armenak Kaiserian in his shoe shop in Bourj Hammoud. After the near annihilation of the Armenian community by the Turks between 1895 and 1915 (an estimated 1.5 million Armenians perished), survivors found refuge in French-protected Lebanon and Syria. Most of these refugees settled in Beirut, particularly in the suburb of Bourj Hammoud. Those who settled in rural Lebanon, notably in the village of Anjar in the Bekaa valley, arrived more than two decades later. Read more about “Little Armenia” in the July-August 2002 edition of the magazine.